Community United Methodist Church in DeBary, Florida began 2013 with a new sermon series entitled Love One Another. In this series we learned how to cultivate Godly relationships with others (spouse, children, co-workers, friends, etc.) by understanding how others best receive/experience love. God is love and Jesus best reveals to us how to love. Dr. Gary Chapman’s book, The 5 Love Languages, provided the themes for the series. 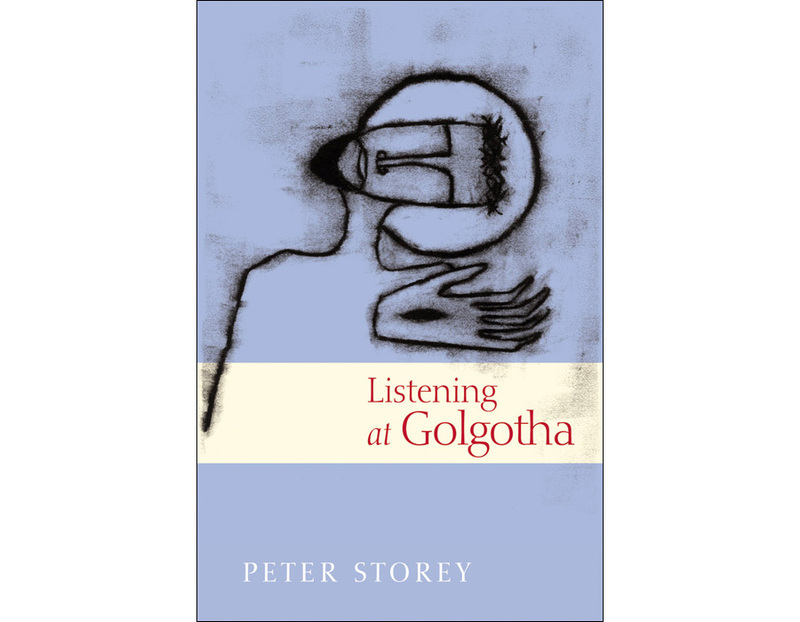 Peter Storey has the rare ability to articulate a deep theological truth in ways that are easy to understand, yet inspiring, yet challenging. Every word has purpose and is carefully chosen, yet the outcome remains approachable and flowing. Themes of personal spiritual formation walk hand in hand with themes of social justice as it does in the Gospels. Jan Richardson’s illustrations are a perfect pairing- simple yet profound. This treasure of a book works especially well for Lenten reflections, one per week, or even Holy Week, one for each day. Last words are always significant. When the last words are spoken by Christ, they take on profound meaning for Christians and the church. Arguably, the last things Jesus said from the cross have to be the most important and life-altering words ever spoken. When you read the story of the crucifixion, you may focus on the most-quoted quotes – “Forgive them” and “Why have you forsaken me?” – and miss relevant lessons in the other things he said. On the surface, some utterances (“I’m thirsty” and “Woman, here’s your son”) may be seen as little more than dialogue or statements of fact. Author Peter Storey finds deep meaning in all of the last words of Jesus (even the sometimes overlooked ones) that can transform your life and your celebration of Lent and Easter. The words Jesus spoke from the cross have helped Christians to hear more clearly the saving word God spoke through the cross. 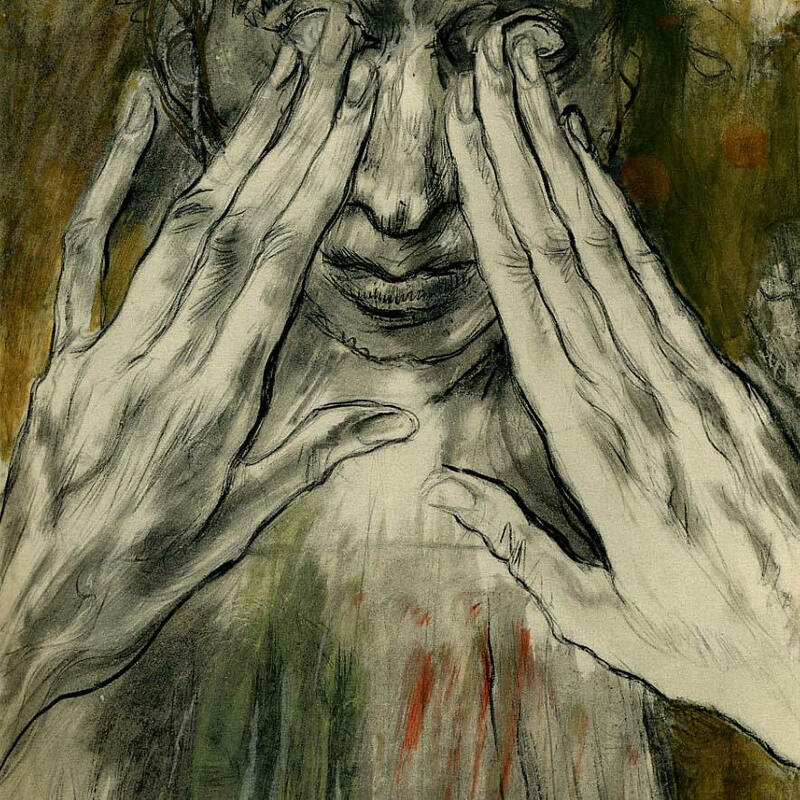 Charcoal illustrations by Jan L. Richardson enhance each day’s meditation. Live the power of the Resurrection more fully by listening to the Seven Words in challenging new ways. If you recognize this work, please let me know the work’s name and/or the artist so I may give proper credit. Open Up Our Eyes compilation with original prayer © 2013 Lisa Ann Moss Degrenia. This is the fifth of five messages inspired by the book The 5 Love Languages by Dr. Gary Chapman. The congregation is invited to take out something to write with and the bulletin insert for taking notes. Click here for the Physical Touch Insert. The prayer following the message is also located on the insert. This message followed a time of prayer for all those effected by the accidental death of a local middle school student only two days prior. Words of Affirmation– For some, they best receive love through what we say and how we say it. Quality Time- love through presence. This is exactly what those grieving Colin’s death need right now. Space to be real. Space to cry or scream. Someone to listen to their questions and their hearts. Receiving Gifts- Gifts are tangible, symbolic expressions of love. We remember the love when we look at the gift or use the gift. Acts of Service- Love in action. Which is closely tied to this week’s love language, Physical Touch- love through contact. In today’s Scripture, all the love languages come together in a powerful way. We also see love abused and ignored. The expert wants to test Jesus. This tells us quite a bit about him. He knows the law well and sums it up in what we often call The Great Commandment. You shall love the Lord your God, for love and life and salvation are from God. You shall love God with your entire being, holistically, a beautiful reminder that salvation means wholeness. You shall love your neighbor likewise. Up to God and out to neighbor, the cross shaped life provided through Christ. Yes! Do this, Jesus says, and you will live, live now and live forever. Jesus reminds us that the Kingdom is a present and future reality. The loving relationships of eternal life break into the present through faith. Your Kingdom come, your will be done, on earth as it is in heaven. The expert is not satisfied. He wants to justify himself, to save himself through the strength of his own words and actions, to save himself by following the law to perfection. Jesus recognizes this and tells him a story. It’s obvious to all the robbers didn’t love the man. They beat him, abused him, and left him for dead. The tragedy of the story is that two others didn’t show him love either. The Priest and the Levite were religious, educated folks. They should have known better yet there are no words of comfort, no quality time, no acts of service. Who shows the stranger love? A Samaritan. This is shocking in the ancient world. Jews did not speak to Samaritans. They were labeled half-breeds and many thought they could have no relationship with God since they worshipped differently and in different locations than the Jews. Yet it is this outsider, the one who understands rejection and has probably experienced it himself, who loves the stranger deeply. He sees the beaten man as another human being, without regard of culture or race. He serves the man and spends quality time nursing him and binding his wounds. It’s easy for us to imagine words of encouragement, “You’re not alone. It’s going to be ok. You’re safe now.” He gives the man use of his own donkey and pays for his extended care. And most importantly, he touches the man. This is the primary reason the religious folks walked on by. They didn’t want to touch him. He was bleeding and touching blood would make them ritually unclean until enough time had passed and enough sacrifices had been made. The religious folks valued the law above a life. This past week my daughter and I were in NYC for her college auditions. As we left lunch and headed towards Times Square, we saw a man lying on the sidewalk. It was hard to tell if he was asleep or unconscious. He had a sign explaining he had been beaten for some reason. Large numbers of people walked right passed him, but my daughter stopped. She was making her way towards him and I stopped her. I was afraid for her, thinking of all the things that might happen. Stopping her and stopping myself from responding to him is now haunting me. I read a passage like this and realize I’m the educated, religious leader who’s now walked on by a human being in need. I should know better and I should have done better. I could have found a police officer who would know what to do, just like the Samaritan found the innkeeper. In John 13:34-35 NRSV, Jesus says, “I give you a new commandment, that you love one another. Just as I have loved you, you also should love one another. By this everyone will know that you are my disciples, if you have love for one another.” Jesus said this when? Right after he washed the disciples’ feet. Jesus wasn’t stopped by tradition or toe jam. Jesus loved deeply and demonstrated that love. Jesus understood the power of touch. Demonstration: Invite someone up from the congregation. Extend your hand to shake their hand and they will respond. Now ask them to extend their hand to shake yours. Refuse to shake their hand and ask them how it feels. Offer to shake hands again and then right after use hand sanitizer. It’s funny but it makes a point. Loving relationships are built on communication. Research tells us that communication is 7% what you say, 38% how you say it, and 55% body language. Christ knew this and so Christ touched people- dead people, bleeding people, people with skin diseases. He was not concerned with being unclean. One time he was brought a man who was deaf and mute. 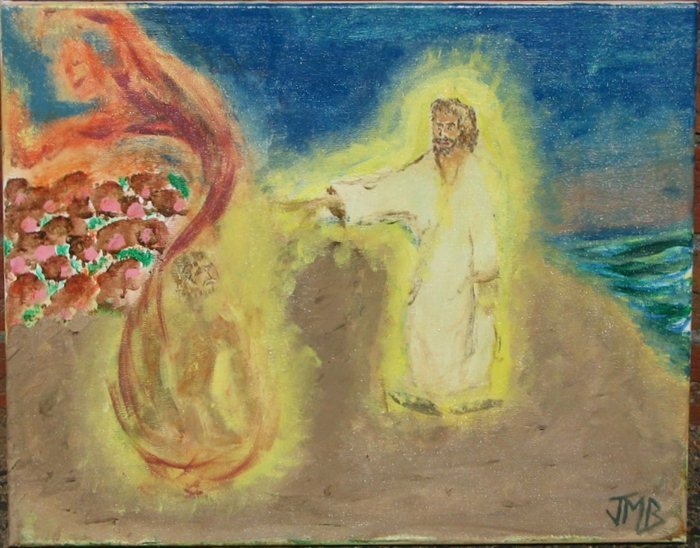 Jesus sticks his fingers in the man’s ears and then holds on to his tongue as part of the healing. (Mark 7:31-37) Another time he was brought a blind man. Jesus picks up some dirt, spits in his hands, and then rubs the mud on the man’s eyes. (John 9:1-7) Jesus wasn’t afraid to touch people, to get involved, to get dirty. Christ touched people and allowed himself to be touched- We think of Mary holding him in her arms and hold him to her breast. Of Jesus welcoming little children (ever have a little one grab your leg and won’t let go?). And what about the notorious woman with the alabaster jar (Luke 7:36-50) who washes Jesus’ feet with her tears and lets down her hair in public in order to dry them. Then she begins kissing his feet. Then she cracks open that exotic bottle of expensive perfume and anoints his feet. The educated, religious folks sneer, but Jesus declares she has been forgiven much and thus she has shown great love. He says she will be remembered for her love and so she is. Jesus allows the guards to whip him and strip him and beat him. He allows them to nail him to a cross till he is touched by death itself. Then a few brave ones perform the last act of love for him. They beg for his broken, bleeding body in order to wash it. Then they wrap it gently in linen and spices and lay him in a stone tomb. But that is not the end. Jesus is raised on day three, alive, and how does he prove it? He says, “Touch me.” Touch the place where the nails were in my hands. Touch where the spear was thrust into my side. You see dear friends, God cares about bodies. Some religions claim only the soul is important. Only the soul lives on, but not God. God creates through speech, but also reaches down into the mud to create through touch. The Adam. The Earth-Man. God – Father, Son, Spirit- aren’t afraid to get their hands dirty. God cares about every part of us- heart, soul, mind, body. Resurrection of the body. Salvation means wholeness. Every part will be redeemed. We has the followers of Christ must also care about bodies, we must touch. This is so important Jesus names us his Body. Like him, we touch even though the world says it’s dangerous, too involved, too intimate, too dirty. Go and do likewise, says our Lord. Go and do likewise. 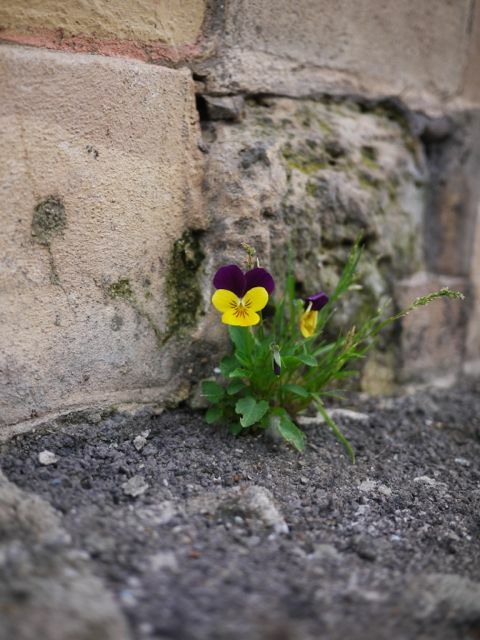 A week ago, on the school run, I spotted these violas growing on the pavement. It would be hard to think of a more inhospitable place for a plant to put down roots: solid concrete with a light sprinkling of grit, heavy shade from parked cars one minute and baking sun the next, not to mention the ever-present threat of dog pee or a heavy foot. I felt sure they wouldn’t last long. But I was wrong, they are still there today, a sweet surprise for anyone who happens to spot them. I do not trust in my bow, my sword does not bring me victory; but you give us victory over our enemies, you put our adversaries to shame. In God, we make our boast all day long, and we will praise your name forever. Trust is the essential key in resilience, trusting that when the curve heads south, God is still at work in the midst of the shifts and changes. Don’t jump off and crash, but pay attention; trust and learn some practices to hold you until the new emerges. The powers of darkness gather about the soul and shut Jesus from our sight, and at times we can only wait in sorrow and amazement until the cloud passes over. These seasons are sometimes terrible. Hope seems to fail, and despair seizes upon us. In these dreadful hours, we must learn to trust, to depend solely upon the merits of the atonement, and in all our helpless unworthiness cast ourselves upon the merits of the crucified and risen Saviour. We shall never perish while we do this—never! When light shines on our pathway, it is no great thing to be strong in the strength of grace. But to wait patiently in hope when clouds envelop us and all is dark requires faith and submission which causes our will to be swallowed up in the will of God. We are too quickly discouraged and earnestly cry for the trial to be removed from us when we should plead for patience to endure and grace to overcome. This is the fourth of five messages inspired by the book The 5 Love Languages by Dr. Gary Chapman. The congregation is invited to take out something to write with and the bulletin insert for taking notes. Click here for the Acts of Service Insert. The prayer following the message is also located on the insert. Love through what we say and how we say it. Some people feel most loved when you give them a sincere compliment or a word of encouragement. Love through presence. Some feel most loved when you make space to give them your undivided attention, when you listen. This often leads to a much needed conversation. 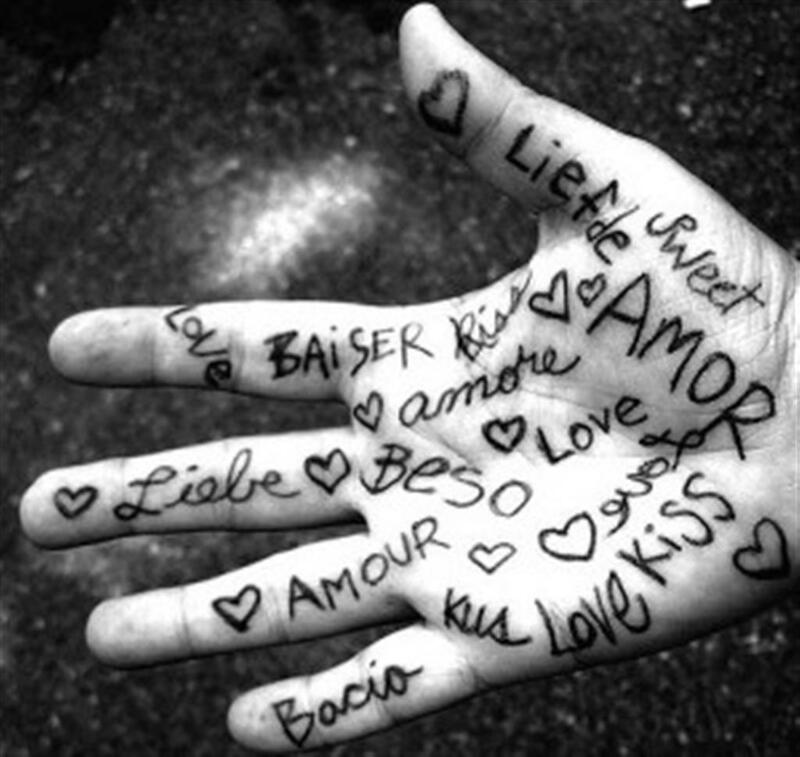 tangible, symbolic expressions of love. When we remember a gift, look at a gift, or use a gift we remember the love and thoughtfulness of the person who gave it to us and we feel loved. Francis of Assisi is known for making God’s love real in many different ways. He lived in Italy around 800 years ago. If you’ve ever seen a statue of a monk with birds and squirrels hanging around like they do for Disney princesses, you’ve probably seen a statue of Francis. He left his wealthy merchant family to live a simple life of nature, preaching, and good works. Francis shared the gospel this way because this is how Jesus shared the Good News, through word and deed and time and gifts. Jesus had great conversations, washed the disciple’s feet, gave away bread, and listened to little children. For many, many folks, this means love in action. In his chapter on the love language acts of service, Gary Chapman tells this story: Michelle sat in the living room, pecking away at the laptop. She could hear sounds from the utility room, where husband Brad was catching up with the piles of laundry. She smiled to herself. In recent days Brad had cleaned the condo, fixed supper, and run the errands, all because Michelle was in the midst of finals for grad school. It made her feel content . . . loved. Some people feel most loved when that love is demonstrated, when love is in action: cooking a meal, washing dishes, vacuuming, cleaning a toilet, changing the baby’s diaper, changing the cat’s litter box. I remember a time when our girls were small and my husband was deployed with the Air Force. An elderly gentleman in our congregation came up to me as said, “I’d like to help you take care of your car. Get the oil changed, check under the hood and check your tires.” I thought, “Thank you Jesus!” I don’t know anything about cars except how to drive them and put gas in them. I also felt loved. Our daughter is getting ready to travel for her college musical theatre auditions. She’s been working up to them for months; applications, essays, after school classes. One day my husband said, “Let me take care of the travel arrangements.” And he did. Weeks later he said, “Let me take care of the financial paperwork (FASFA and CSS).” Thank you Jesus! I’ve never loved him more. Jesus put his love into action and we as followers of Christ still share the Good News this way today. Christians feed and clothe the poor, fight human trafficking, build water wells and hospitals and homes and schools. Every week in the bulletin we list opportunities for you to exercise your faith and your love in service to others. Why? It’s as essential as worship and growing your faith through small group studies. Come to think of it, serving others is worship, an offering of thanksgiving to God. And we know how much we grow through serving. It stretches us and makes the Scriptures come alive. Maybe this is how you came to know the love of God, through the kindness of a friend, family member or even a stranger. Maybe the hunger to make a difference, right a wrong is what drew you to faith. You might be thinking, “Well isn’t this just random acts of kindness.” No, we’re not talking about random acts. We’re talking about intentional acts to make God’s love real, and our love real. We look for ways to serve and heal and provide. And we go out of our way to do it, just like Jesus did. We know love by this that he laid down his life for us—and we ought to lay down our lives for one another. How does God’s love abide in anyone who has the world’s goods and sees a brother or sister in need and yet refuses help? Little children, let us love, not in word or speech, but in truth and action. Look and listen. People are in need all around us. What they say is a clue to what they need. What are they worried about? What are they complaining about? We have to really look and listen, because some people have a hard time sharing their needs. We don’t want to appear weak or needy. We want to be self sufficient. But, this is why God gives us each other. No one can do everything and no one goes through life without needing help. Then there’s the other side. Some people have a hard time serving. They hear Jesus’ call, “I have not come to be served but to serve” and they cringe. (Mark 10:45) Servant to them means doormat. God isn’t asking us to be a doormat, to be stepped on or kicked around. Doormats can’t love. People love. To some servant means slave and slaves have no choice but to serve. God isn’t asking us to be slaves. Love isn’t forced or manipulated or coerced. Love is always a choice. We follow Christ, out of gratitude. We choose to love and we choose to love in healthy ways. It has the ears to hear the sighs and sorrows of [others]. Choose, my friends. Choose as Christ did. Choose to make God’s love real. Please consider patronizing today’s featured artist, Marca Sue DeLacerda.